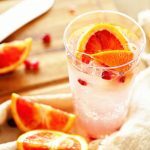 Whether it's a summertime sip or a pretty cocktail for holiday time, this Paloma Recipe will be your new go-to cocktail! Add several ice cubes to a tall cocktail glass. Add a shot of tequila and top with grapefruit soda. Finish by squeezing a couple wedges of blood orange into the cocktail and give it a stir. Top with additional slices of oranges and pomegranate arils. Sip and enjoy!